Just like women, men too, like to dress up! 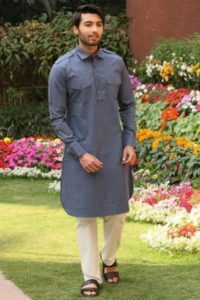 Wedding seasons or ethnic festivities (Diwali, Ethnic Day at office, Onam, name it all), men want to look classy and stylish, driving them to experiment with the different traditional and ethnic outfits, and browse through various styles and trends to create their unique style statement. They always want to pick out something than the usual ones. 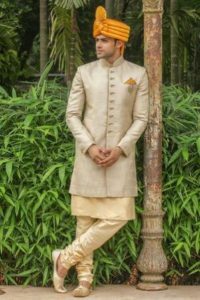 With the Indian ethnic clothing scenario being very rich and elegant, men have so many different options to choose from, like Sherwanis, kurtas, jackets and more, be it for weddings, religious events or simple family get-togethers. So here is comprehensive guide of the different types of ethnic and traditional dresses for men, from formal to casuals for different occasions or ceremonies in India. 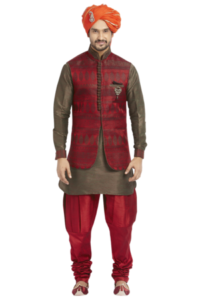 In the ethnic game, the kurta-churidar combo definitely has more fans than any other ethnic outfits among men. Apart from being extremely comfortable, it is easier to wear and style and hence is a popular choice among men. 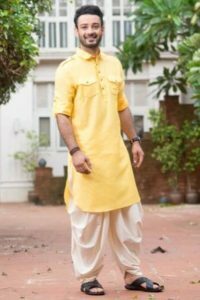 The best part about a kurta churidar is that it is extremely versatile, from being your savior for an Ethnic day or Diwali celebrations at office to wearing it to your cousin’s Haldi ceremony! Moreover, if you feel that your solid colored kurta is too bland and boring, you can easily pull on a printed jacket or use a elaborately decorated brooch and maybe a turban in a contrasting shade and Juti to complete the look. 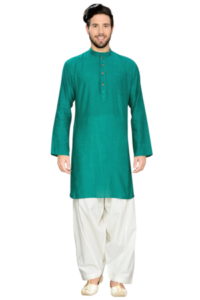 Just like the kurta churidar, the kurta salwar is another great combo that provides lot more comfort along with style. The salwar, being much more of a loose fit and a bit baggy, provides a totally different look. There are even Patiala kind of Salwars, as well as salwars with embroidered patterns or gold or contrasting borders to create a modern or contemporary look. The groom’s favorite, the classic Sherwani! Usually worn for a grand affair, from simple ornate ones to Indo Western exquisite and designer wears, today, there are so many different varieties of sherwani, in myriad fabrics, that it has become difficult to choose one. Sherwanis, originated as the northern Indian dress for the Mughal royalty, have evolved to wedding wear for men in the modern day. More so often, they come accompanied with a safa, churidar/dhoti pant styled bottoms as well as a dupatta. A variant of the classic Sherwani, is the Achkan Sherwani, which is a perfect choice to make a style statement. It is a dapper and fashionable attire that can add jazz to your looks. It is one of the most popular choices in sherwani that anyone would love to wear on their wedding day to make it classic. This knee-length coat is more trimmed and fitted to give a compact masculine look. The main difference between sherwani and achkan lies in their length, fabric and the massive flare from the waist. The sherwani is little longer than the achkan and is more flared from the waist till the bottom. Tip: If you are of a short stature, then Achkan is a good choice than the normal Sherwani that needs you to be slightly on the taller side to be able to carry off the flare and length. Often referred to as the prince coat, a bandhgala has now become a must-have in every man’s wardrobe. It will lend you a sophisticated yet masculine look, be it for a wedding or a celebration dinner with family. The ultimate benefit of owning a bandhgala is that it can flatter any body type and promises a royal look. To achieve the original look of a bandhgala, one needs to be extremely particular about getting the right cut and fit. It should always be like second skin. The length is ideally dictated by the body type. Moreover, you can easily accessorize it with a brooch, pocket square or turban with kilangi. Tip: As a general rule to follow, the length of the suit should end just at the root of the thumb while the arms rest against the body. The Pathani suits are among the most stylish and popular mens ethnic clothing which can be worn on all occasions. This ethnic and elegant outfit exudes a sense of style and class. The traditional suits feature simple kurtas with front buttons and stand collars. However, the modern suits feature beautiful embellishments with stylish collars in so many different shades and fabrics. An amalgamation of Indian and Western styles, resulted in a category of their own, popularly known as the Indo Western style outfits. They feature the usual ethnic attires with a western twist, like asymmetric or cowl hemlines, exquisite collar designs, printed long coats etc. They have become hugely popular in the recent times with more young men opting for these contemporary outfits. Named after Pandit Jawaharlal Nehru, these mandarin collared vest jackets, are a trendy and one of the ‘must haves’ in a man’s closet. Nehru jackets can easily compliment each and every look flawlessly and is capable of taking your traditional look to a whole new level. They can transform your outfit instantly and making you look ethnically fashionable. Always dreaded the dhoti falling off in the middle of a function or a wedding? With the introduction of dhoti pants, you can bid adieu to that fear. While you can just slip it on like any normal pants, it has the flare of a dhoti giving the illusion that you are actually wearing one. Available in so many different shades and fabrics, you can easily team it up with a bandhgala, kurta, Sherwani or Nehru jacket for a style that will surely make heads turn. Tip: Choose in contrasting shades to the kurta. Kerala Dhoti or Mundu is a popular attire, in the regions of Kerala and Tamil Nadu. Despite the considerable influence of Western dressing, mundu still garners all the love and attention among the men here. It is not just for ceremonial and customary purposes, but men find it easy and comfortable to wear it on a daily basis. No traditional occasion is complete in Kerala without wearing the mundu, that is usually doubled and draped around the waist. Available in fabrics like khadi, silk, dupion and cotton, they come in shades like creme, ivory, off white,and white, with borders in gold, silver and other shades. If you thought accessories were a women’s domain, then you are completely wrong. In fact, today, men have a number of accessories to choose from, that they are literally spoilt for choices. Accessories are a game changer! They are capable of creating a huge impact on a man’s outfit and his sense of style. But having said that, you also need to exercise caution to ensure that you are not overdoing it. So here are some of the top accessories that men could use to their advantage and elevate their ethnic look. So men, be ready to grab some attention! Turbans play an important role especially during the wedding festivities. And today, it is all about doing it in style. Turbans are a long colorful clothing material, used as a headdress for men, manually tied. In the recent times, ready made turbans are easily available and spares you the trouble of mastering the art of tying them right. On the other hand, Safas are a shorter and broader version of a turban and much fancier. They usually have more embellishments and small fan like pleats stitched on top. You can easily compliment your attire, be it Kurtas, Sherwani, Jodhpuri suits or Nehru Jackets, with contrasting coloured or floral patterned turbans to create a style statement. They are not just for women. Even men can wear it and flaunt it with ease. A stole or dupatta is usually a narrow long piece of clothing, with tassels. It maybe of crushed silk or dupion fabric and is mostly worn by men around the neck or across the shoulders towards the front. Most of them are single coloured like black, white, red, etc with a tinge or border of gold, and look classy when paired with the right kind of outfit like Kurtas, sherwani, achkan and other indo western outfits during any celebrations, wedding, or festivities. 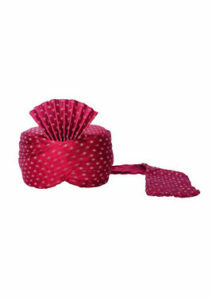 Kilangi/Kalangi is an accessory that is worn on the turban during a wedding or any such occasion. A royal mark of honor, mainly made in metal and embellished with stones, precious gems, beads and feathers to give you men that rich look and grandeur. It ideally adorns men’s turbans and you can even take i to the next level by pinning it on Sherwani or bandhgala suits as a brooch as well. How to identify: the pocket square is mostly for show, and belongs in the jacket breast pocket. It is normally made of silk, cotton, satin or dupion and is small enough to be folded without creating a bulk. Often confused with handkerchiefs, this is another classy accessory that can create a fashion statement. They instantly add the dapperly charm to any look. Ideally, choose them in contrasting shades to sport with Printed or solid jackets, nehru jackets or bandhgala suits (with pockets), for weddings, Sangeet, or any festivities. A slip on style shoe, usually with a flat sole, and are similar in design for both women and men, except for men, they have a sharp extended tip, nokh curved upwards like traditional mustaches, and are also called khussa. These were considered ceremonial kind of shoes and appeared in rich embellished designs or elaborate patterns. They are best suited to be worn with Kurtas, sherwani, achkans, dhoti pants, jodhpuri suits, for any ethnic celebrations, Weddings. A brooch is nothing but a sparkly or embellished pin style accessory that is meant to be placed on the lapel of your coat or jacket. It may be further styled with beads and jewels hanging from it. The most desired brooch on a sherwani or other Indian wedding outfit is the floral designed brooch. Brooches made of precious gems are also available and this can make your outfit even richer and can transform simple attires into opulent ones. You can wear a brooch with Jackets, especially plain ones, nehru jackets, bandhgala or jodhpuri suits and sherwanis. Weddings, sangeet, and other similar celebrations are a great opportunity to bring on some brooch swag! With every passing day, more and more styles and trends are being introduced in men’s ethnic wear. Do you think we have missed out on something? Let us know through your comments.